Your Complete Brochure Printing Company. Partner with AlphaGraphics Today and Discover High-Quality Brochure Printing. Our complete brochure printing services offer cost-efficient solutions that will meet or exceed your project’s objectives. Perfect for point-of-purchase applications, trade shows or direct mail marketing— ask an AlphaGraphics professional today how our comprehensive design, marketing, printing, paper substrate selection, folding and finishing services can help ensure your print brochure project is a successful marketing tool that gets results. Full-Color or Black & White Printing. Choose from high-quality black and white, full-color or spot-color Pantone® printing. Our digital press and high-speed offset printing systems will reproduce your brochure photos, copy and illustrations exactly to your project’s specifications. Flexible Folding & Finishing Choices. Choose from half-fold, tri-fold, accordion fold, Z-fold, quarter fold, four panel fold, gate folds or your own custom fold using common trim sizes such as 8.5″ x 11″, 8.5″ x 14″, 11″ x 17″ and 11″ x 25.5″. Ask how specialty finishing services such as custom die-cuts or UV coating can help make your final brochure product get noticed. Contact an AlphaGraphics Professional Today to Start Your Brochure Printing Project. AlphaGraphics workflow solutions in printing, bindery, finishing and fulfillment ensures optimized productivity and increased speed to market. Our workflow is based on ISO 9001:2008 standards and incorporates lean manufacturing philosophies which allows you to schedule and distribute print products efficiently. 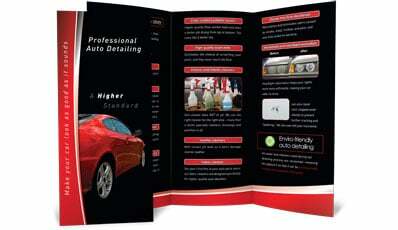 Develop a targeted and effective message on your next brochure printing project with AlphaGraphics marketing services. From expert layout and design services to custom product design and marketing strategy— we can help your brochure printing project get results. Contact an AlphaGraphics professional today to learn more. Get Started Today and Discover Complete Brochure Printing Solutions.